Legislator Anker Attends UCP Thank-You Event. Mount. 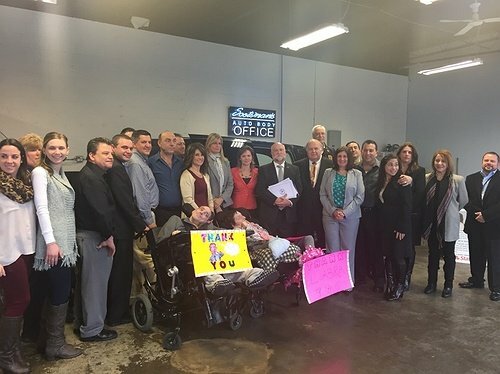 Sinai, NY - March 27, 2015 - On March 26, 2015, Legislator Sarah Anker attended “Paying it Forward: UCP of Suffolk to Receive Donated Accessible Van from Little Sisters of the Poor” at Scotsman’s Collision in Mount Sinai. United Cerebral Palsy (UCP) Association of Greater Suffolk, Inc. received a wheelchair accessible van and two motorized wheelchairs donated from Little Sisters of the Poor’s Philadelphia chapter. State Farm Insurance originally donated the van to Little Sisters of the Poor. The organization then donated the van back to State Farm for UCP’s use. The van was transported from Philadelphia to Long Island and refurbished with the help of the Long Island Auto Body Repairmen’s Association, National Auto Body Council, Recycled Rides, Scotsman Collision, and State Farm. The two motorized wheelchairs will be used at UCP’s Health Center in Central Islip and the mobility van will be used by the organization’s Residential Program to transport individuals with disabilities to appointments and community events. Subject: LongIsland.com - Your Name sent you Article details of "Legislator Anker Attends UCP Thank-You Event"